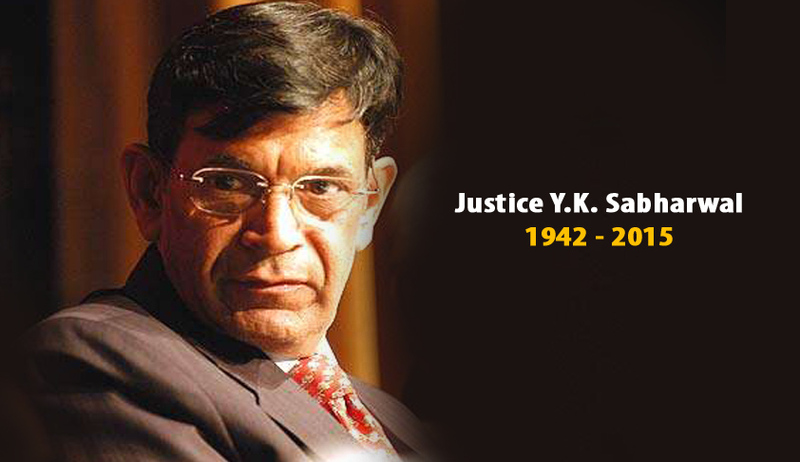 Former Chief Justice of India Yogesh Kumar Sabharwal passed away today, at the age of 73. Justice Sabharwal enrolled as an advocate at Delhi in 1964. He mainly practiced on the Civil & Constitutional sides In the Delhi High Court. He worked as an Advocate for Indian Railways from 1969 to 1981, as an advocate for Delhi administration from 1973 to 1976-1977, later as Additional Standing Counsel and then as Standing Counsel. He also served as Counsel to the Central Government from 1980 to 1986. He represented Delhi in the Bar Council of India from 1969 to 1973. He became an Additional Judge in the Delhi High Court on November 17, 1986 and a judge soon after. On February 3, 1999, he was appointed as Chief Justice of Bombay High Court. In less than a year, he was appointed as a judge, Supreme Court of India. Being the senior most judge of the Supreme Court of India at the time, Sabharwal was appointed as the Chief Justice of India to succeed Mr. R.C. Lahoti who was retiring on October 31, 2005. He was sworn in as the Chief Justice by the President of India, A.P.J. Abdul Kalam on November 1, 2005 for a period of about 14 months. He retired on January 14, 2007. He handled several important matters, including Public Interest Litigations relating to forest and environmental issues and one on diminishing tiger population from Sariska National Park, which required the intervention of Prime Minister Manmohan Singh, at the Government level. A Constitution Bench headed by Justice Sabharwal on October 7, 2005 had held as "unconstitutional" the dissolution of the Bihar Assembly on the basis of the report of Governor Buta Singh, but had declined to revive the House, paving way for four-phase elections. You may read the judgment here. He headed the bench which refused to grant any relief in the 2006 Delhi sealing drive in which thousands of illegal constructions were demolished across Delhi. This became controversial after it was later found that his two sons were connected with the real estate business in Delhi. In 2007, he headed a nine judge constitution bench which ruled that all laws placed under the ninth schedule after April 24, 1973, shall be open to be challenged in court if they violate the fundamental rights guaranteed under Article 14, 19, 20 and 21 of the Constitution. This judgment was made in response to a number of petitions made on various laws including the Tamil Nadu Reservation Act, 1994. You may read the judgment here. Justice Sabharwal had started the trend of writing summary of judgments for journalists, where the judgments were lengthy and complicated. He is credited to be the one who took the TV journalists inside the Chamber of the Chief Justice for the first time. He has surely left his mark on the judicial system. His cremation has been organized for tomorrow at 11 am at Nigambodh Ghat in Delhi.